Wikipedia refers to the Iraq war as follows: "The Iraq War, or the War in Iraq (also referred to as the Occupation of Iraq, the Second Gulf War, or Operation Iraqi Freedom by the United States military), was a conflict that occurred in Iraq from March 20, 2003 to December 15, 2011, though sectarian violence continues since and has caused hundreds of fatalities." Well said. Again, call this campaign anything you want, but realize this was and is part of the global War on Terror. If you believe this invasion was disastrously stupid, then please tell me how you think the last 10 years of fighting terrorism would have been better with Saddam Hussein still in power in Iraq. What follows below is discussion around how to monitor the developments in Iraq as they fight to establish a country that is friendly with itself and its neighbors. After a contentious interagency debate, the United States government has designated the entire Islamic Revolutionary Guard Corps and many of their affiliates and subordinate organizations as terrorist organizations. By the New York Times’ estimate, this enables the U.S. to impose economic and travel restrictions on up to eleven million people, including some Iraqis. To get an idea of how broad this declaration is, the IRGC only has an estimated 125,000 military personnel. 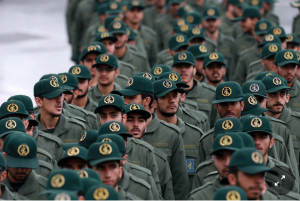 The paramilitary “police force” known as Basij is technically under their command, and they have approximately 90,000 regular soldiers and 300,000 reservists. The elite Quds Force, the likely element responsible for any acts of foreign state-sponsored terrorism, has no more than 20,000 members. The reason this could directly impact as many as 11 million people is that the IRGC is much more than a military organization. It’s an economic powerhouse, controlling more than a hundred companies and billions in contracts. As far back as 2007, during the administration of George W. Bush, the U.S. has contemplated designating the IRGC as a terrorist organization, but it is only in the wake of the Saudi Arabian government’s brutal assassination of journalist Jamal Khashoggi in their Turkish consulate that the effort gained steam. Last October, when international opprobrium was at its height, the Kingdom (and its satellite, Bahrain) made an effort to distract the world from their misdeed. When they declared the IRGC as a terrorist organization, Iran pointed out the obvious: “Saudi Arabia is in a quagmire it cannot easily come out of,” Iran’s Mehr news agency quoted Brigadier-General Esmail Kowsari, the Revolutionary Guards’ deputy security chief, as saying on Tuesday. “Saudi rulers are trying to distract the world and the region from the killing of Jamal Khashoggi, the Saudi journalist, in their consulate in Turkey,” he added. The New York Times doesn’t mention Jared Kushner as having any potential role in this decision despite his close relationship to Saudi Arabia’s leader, Mohammed Bin Salman. Instead, they place responsibility for the decision on the administration’s two most notorious anti-Iran hardliners: ... Secretary of State Mike Pompeo and John R. Bolton, the national security adviser. 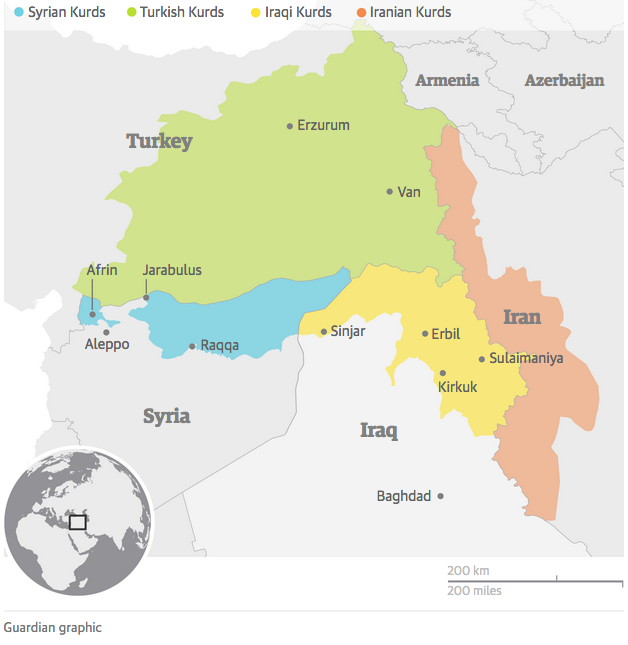 More than 92% of voters in Iraqi Kurdistan have opted for independence, according to election monitors, in an overwhelming endorsement of a proposed split from Baghdad that has sparked increasing threats of air and land blockades that could be imposed as early as Friday. The result came after Iraq’s parliament authorised the prime minister, Haider al-Abadi, to send troops into areas disputed between Arabs and Kurds that were contentiously included in the ballot. 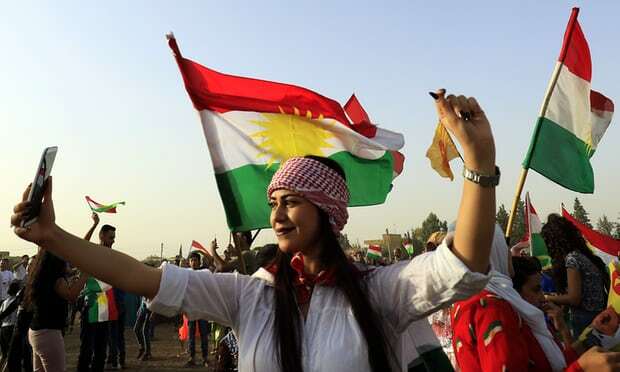 Euphoria on the streets of Erbil in recent days has been met with sharply increasing tension in the region, which is likely to escalate in the wake of the result. Possible Alliance In Works Between ISIS & Al-Qaeda?